We’d love your help. Let us know what’s wrong with this preview of The Goliath Code by Suzanne Leonhard. A cataclysmic eruption has turned America into a suffocating wasteland. In sixteen-year-old Sera Donner's isolated Pacific Northwest town, thousands are dead and hundreds are missing, including her own mother. With precious resources running low, neighbor turns against neighbor, sparking a brutal civil war, and when the new survivalist regime decides Sera's disabled brother isn't fit to live, she picks up the rifle she’s vowed never to touch, and fights to defend those she loves. Mysterious Micah Abrams is Sera's only comfort in the chaos; Micah clings to an inexplicable hope that Sera finds hard to resist but difficult to understand. She longs to let down her guard and reveal to him a secret that's tearing her apart. But with the stakes higher than ever, can Sera really trust a schoolyard bully suddenly turned prophet? As the battle over control of the community reaches a fevered pitch, a powerful military leader marches into town with an imposing force, offering food, water, and promises of salvation. Everyone thinks the worst is finally over. 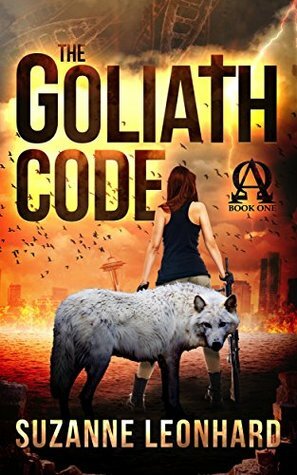 To ask other readers questions about The Goliath Code, please sign up. After reading this first book, I wonder at the depth of research that went into it. Was ancient text and hypothetical reasoning factored in along with biblical books of revelation and other books from the published bible? Joan Cook I wondered the same thing because from my biblical research, the Antichrist (the Praetor?) doesn't appear in the U.S. but in Jerusalem, Israel. The story was developing so nicely and it was really interesting, but then Christian religion was brought into it, and everything went downhill from there. A fabulous story with wonderful characters. It's a gripping page turner from start to finish. In parts heartbreaking , in parts terrifying. I couldn't stop reading and can't wait for more. I'm thrilled that just lately I've managed to find books written from a Christian viewpoint. Books that are clean and yet gritty, honest and certainly inspiring. I hope we won't have to wait too long for the next in this brilliant series. This book starts out like many post apocalyptic thrillers, but eases into a more important message of what is to come than most other stories of this genre. I really like the characters and am eager to read the next two books of the trilogy. I rated this book a 5 because it is one of the best books I've read in a while. I literally couldnt stop reading it! It's Christian fiction at its best. I can't wait for book 2 to come out and read more of Sera's and Micah's journey. Y'all need to read this! We are proud to announce that THE GOLIATH CODE by Suzanne Leonhard is a B.R.A.G.Medallion Honoree. This tells readers that this book is well worth their time and money! Can't wait for the next book in this series. A page Turner from the get go. A fresh perspective on the end times. I decided to give this book a read after it popped up on my Amazon recommendations. It gets your attention immediately and I was hooked from there! This book has everything! Apocalyptic natural disasters, wars for survival, an oppressive government stepping in, genetic engineering, a little romance,and much more! The author weaves all these storylines together seamlessly. My only complaint is it ended too soon and book 2 is not out yet! Very much looking forward to the next book in the series. Well worth the read if you enjoy this type of fiction. Great plot line and characters. I’m not usually drawn into the dystopian type future novels but the other good reviews prompted me to give it a go. Glad I did. Great read! Loved the characters and cannot wait to read the rest of the trilogy. Book 2and 3here I come. I started the book yesterday and wasn't sure I was gonna finish it because I didn't see where the story line was going. Just a few chapters in, I was hooked and finished it tonight. Good characters and the story moved at a great speed. Can't wait for the next book in the series! I wasn’t quite sure what to expect when I started reading this book, as it appeared to be a bit different from my typical read. It was, and I am certainly glad I decided to give this one a try. Sixteen-year-old Sera Donner finds herself in the fight of her life, in a way she never imagined. Thousands are dead or missing, including her mother. A cataclysmic event has occurred, and it has pitted neighbor against neighbor, with chaos everywhere. In order to survive, will she pledge her allegiance to I wasn’t quite sure what to expect when I started reading this book, as it appeared to be a bit different from my typical read. It was, and I am certainly glad I decided to give this one a try. Sixteen-year-old Sera Donner finds herself in the fight of her life, in a way she never imagined. Thousands are dead or missing, including her mother. A cataclysmic event has occurred, and it has pitted neighbor against neighbor, with chaos everywhere. In order to survive, will she pledge her allegiance to something she detests? Could everything she thought to be true be a lie? This is one book that will likely make the reader think about things in a different way. Sci-fi elements mixed with modern technology combine in this imaginative novel. While geared for young adults, adults are likely to enjoy this, as well. The fast-paced action rivets the reader from the start. Leonhard offers a different take on the tribulation, with Revelation (Biblical) themes woven throughout. There is mild language and violence. Vivid descriptions make the story unfold as if watching a movie. I look forward to reading the sequel, since this book does end with a cliffhanger. Disclaimer: I received a complimentary copy, but I wasn’t required to leave a positive review. Can't wait for the next book to come out. Couldn't stop reading. I was up all night. You won't regret getting this one. I really enjoyed reading this book and looking forward to book two in the series. I loved the characters and the storyline. I have read a lot of post apocalyptic books I the last couple years most of which are set after an EMP or pandemic. This book takes a different doomsday approach a super volcano. I have read a lot of literature about the Yellowstone caldera and the threat is a real possibility in our lifetime. Such a good book. I really cannot wait for Book Two, this author has a fabulous imagination and has created some really wonderful characters. Anyone who enjoys a well written fast paced story will enjoy this book. This book was truly amazing, I couldn't put it down! The only drawback was that there is a part 2 that hasn't come out yet, so I have to wait for it! Interesting take on the end times and the very real possibility of Yellowstone erupting. Loved the different characters. Can't wait for the sequel. My original Goliath Code audiobook review and many others can be found at Audiobook Reviewer. An eruption at Yosemite has immersed America in total chaos. Many people died and many cities were destroyed. Sera and her brother David have lost their parents during the cataclysm, an with that, David's hopes of becoming normal. David and Sera's father was a scientist specialized in genetic modifications using nanobots, and he had the key to give his son a normal body. David and Sera will face the chal My original Goliath Code audiobook review and many others can be found at Audiobook Reviewer. An eruption at Yosemite has immersed America in total chaos. Many people died and many cities were destroyed. Sera and her brother David have lost their parents during the cataclysm, an with that, David's hopes of becoming normal. David and Sera's father was a scientist specialized in genetic modifications using nanobots, and he had the key to give his son a normal body. David and Sera will face the challenges and danger, each one in a different way, while they witness how Europa saves America in an unexpected way. This book had all the ingredients to be an enjoyable post-apocalyptic story for young adults. We have two strong main characters, who antagonize each other at times. We see a clear evolution in Sera, and the way she decides to take matters in her own hands. There is also deception, mystery, and blood, lots of blood. The plot was a bit chaotic at times, but it kept me interested. Somehow, I didn't understand Sera's decision of hiding what happened to her mother. It seemed to me at first, that it was going to be a decisive event in the book, one that could change things. And it did, eventually, just not in the way I expected, and I have to say that I felt disappointed, and even cheated towards the end. There were also other characters' actions that I found strange and that made them less real. There is some romance, as anyone would expect in a YA book. Not too much, but there nonetheless. I added some value to the story, and created some dynamics among several of the characters. The next point may be controversial. There is quite some religion in this book. A lot more towards the end, and for me this is not a good thing in a sci-fi/post-apocalyptic book. I think authors in general should understand that their books are read by a vast public, and that many of their readers might be atheists or have a religion other than Christianism. For me, this high level of religion in a book is a total setback. Things just don't work in the end if you pray and put up with things. Things work out if you fight and work hard for them. Or that is what I would like to read in a book. Only reason I gave this a 4star was that the second book is not ready! The story itself was great. Nice to see a more realistic cause for”end times”. Especially one where zombies are not involved. Loved all the characters even the evil ones. Very well done descriptions that let you truly “see” them. Story does involve bible “end times” references but they are expected since the book is listed as Christian science fiction. Good book. An easy read, faced pace, and interesting all the way through. Some bad language I didn't see a need for. Didn't add to the story but gave me pause. I almost quit reading after the first few. I enjoyed the book in spite of my dislike reading bad language. If book #2 does not come along quickly I am going to be pretty upset. The setting for this story is very familiar and I love how accurate it is to what could happen when the REAL end comes. Couldn't stop reading. I found this book hard to put down. The characters were interesting and the storyline was quite believable. I’m looking forward to the next book! A story with an unique twist or two. Characters that are believable and interesting. It just did not work for me on a personal level. Wonderful suspense, stayed up all night to finish it. Can't wait until book two! Put it on your reading list!